Feature: 7 things to look out for when buying a suit in Singapore! Hi guys, today we will taking a (short) break from reviewing watches, and will be talking about suits instead! Every male needs at least a set of form-fitting suits, but what I realise is that most millennials have no idea what to look out for when buying a suit, and simply grab a cheap option that’s on discount at H&M and Zara. A lot of people (me included) make the mistake of buying a cheap, off the rack suit that we use once for prom or an interview, then chuck away into oblivion. Well, a good suit should last you years, and not be disposable. Today, I’m gonna enlighten you guys about 7 things to look out for when buying a suit in Singapore! 1) Avoid fused suits – buy a canvassed one. For suits, there are generally three grades of construction: fused, half-canvassed, and full canvassed, in ascending order of quality. Avoid fused suits like the plague. The construction of a suit is rather complicated, so I’ll try to keep it simple here. For a suit to maintain its shape, an interlining is applied to the inner side of the suit. Traditionally, this lining is sewn on by hand. Such suits are termed as canvassed. A fused suit is when the lining is glued on, instead of being sewn. Fused suits are the lowest quality of construction – avoid them! Firstly, a fused suit is much less durable as glue degrades over time. Wash them too much or get caught in the rain and air bubbles could appear on the suit, rendering the suit near unwearable (Unless you want to look like a fool). Secondly, a fused suit is less comfortable, often stiff-feeling. This limits your movements – wearing a suit shouldn’t feel like wearing an ILBV! Cheap suits bought off the rack are almost always fused to save cost. However, an expensive suit could be fused too, especially at designer labels such as Hugo Boss or Armani. Touch the breast area fabric of the suit to feel for yourself, and when in doubt ask the sales associate (assuming he’s honest). 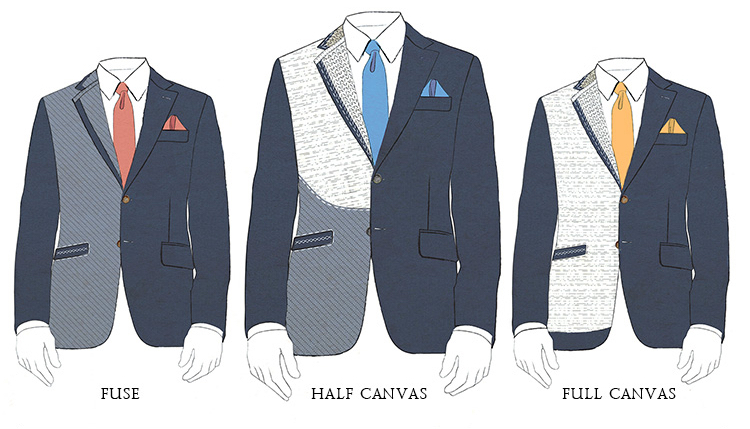 I personally recommend a half-canvassed suit. While a full canvassed suit is of the best quality, they often cost 4 figures. A half-canvassed suit gives you the best of both worlds, in term of quality and value. A half canvassed suit means that the upper portion of the suit is sewn, giving you upper body mobility and comfort, while the bottom half is fused. You can find a half canvassed suit (2pc) anywhere from $300-$900 (SGD), depending on the material. With suits, always buy one constructed from natural fabrics such as cotton or wool! Avoid synthetic materials such as polyester. I’ve said this before in my shopping tips post, but with suits it is even more important. Cheap blazers from mass-market stores like Zara and H&M are going to either be constructed from synthetic materials like polyester, or have an inner lining made of polyester. Choose a suit made from natural fabrics, including the inner lining. This is paramount in Singapore, where temperatures are often hellish. Wool, being a natural fabric, is extremely breathable, and should keep you cool even during hot days. It’s no overstatement to say that the fabric is the most important part of the suit. If you have a tighter budget, (i.e <$400 for a 2 piece suit), I recommend a wool blend. Sure, it’s not as good as 100% wool, but if you’re not planning to wear the suit everyday (meaning you only require it for special occasions), a wool blend suit will be good enough. On the other hand, when buying a more expensive suit, you might come across tailors describing their wool in numbers, such as 110s, 120s, 150s, 180s, etc. Generally, the higher the figure, the better quality the fabric. However, this may not always be the case as there’s no formal grading system. Let me use an analogy – wool super numbers are like megapixels count in cameras. Yes, generally a higher count does mean better quality, but it is not always necessarily the case. 3) Don’t forget about the buttons! Ah, a detail that’s often overlooked. Most people pay attention to the fit, to the fabric, to the construction, but tend to forget about the buttons. Avoid plastic/synthetic buttons! They look cheap and shiny, like some $1 trinket you bought at a pasar malam. Go for buttons made from natural materials such as horn, mother-of-pearl, or corozo. Again, if you’re on a tighter budget (<$500), you will often come across faux horn or wood buttons. Don’t forget about the buttons – the devil is in the details. Quality buttons elevate the suit. If you’re buying a more expensive suit, you should ensure that you have working buttons (i.e surgeon cuffs). This means that you should be able to roll up your jacket sleeve. While admittedly it serves little practical function in today’s world, working buttons are often one of the hallmarks of a quality suit. Also, cardinal rule of wearing a suit: NEVER button the last button. Don’t be an idiot. 4) Your jacket and trousers should be of the same material and color. This is a rather common mistake that I see – people splitting up the purchase of the suit, i.e buying the jacket and trousers from different places. To be honest, I made this mistake myself too. I owned a black formal pants from G2000, and just bought a black blazer from Asos to pair it. Of course, it didn’t go well together. Want to be as stylish as James Bond? Then listen to me! 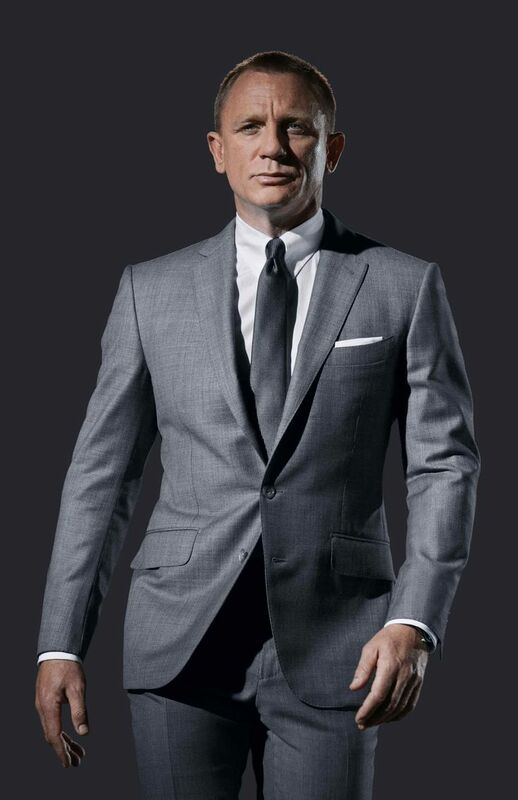 Your suit (jacket+trousers) should be made from the same fabric, in the same color pantone. The best way to make sure they match is to simply buy them as a set from the same tailor. This is the reason why ALL tailors sell suits in 2 pieces or 3 pieces (with a vest – in this case the vest too should be of the same fabric and color). 5) You should like the style and look of your tailor. Different tailors have differing styles. Go to Saville Row, and each individual tailoring house have their own distinct taste – this translate into the fabrics they stock, the cuttings, etc. If you like the vibe of the place, chances are that you will enjoy the suit as well. When you walk into a tailoring store, look at the tailor himself. Do you like his dress sense? Does his own clothing fit him right? Thereafter, take a look at the samples displayed in the store. Do you like what you see? Is it too flamboyant, or too conservative? Do you see lots of customization options and infographics being displayed? This may sound a bit iffy, but if you walk into a tailoring store and like its “vibe”, chances are that you will like the look of the end product. Generally, people have no clue what they should expect for the money they part with. Let me enlighten you guys a bit. <$400: For under $400, the fabric will often be a wool-blend, with polyester lining. Construction should be half-canvassed, and buttons should be faux-horn/wood/mother-of-pearl (meaning to say buttons that has the look of those materials, but is actually made of plastic). There will generally be no fitting process. <$800: For under $1000, the fabric will still often be either a wool-blend with a full-canvassed construction, or 100% wool with a half-canvassed construction. Buttons should be made of natural fabric, such as horn/corozo. There might also be a fitting process. <$1600: For under $1600, the fabric should be “branded” wool with a full-canvassed construction. 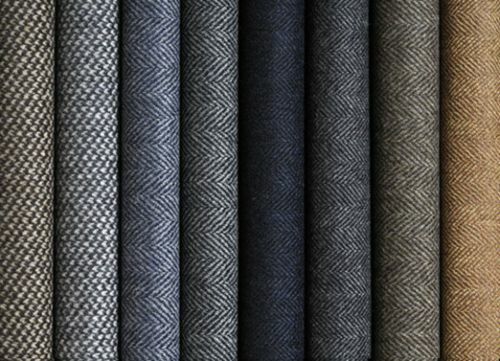 There are mills in England/Italy dedicated to manufacturing wool textiles for suits – common names are VBC (Vitale Barberis Canonico from Italy) and Holland & Shery (from England). Buttons will definitely be made of natural materials, sometimes even precious ones such as mother-of-pearl. There should definitely be a fitting process around 2-3 weeks after your initial measurements are taken. >$1600: If you have tons of cash to splash, go bespoke. Go to Dylan & Sons, or Kevin Seah. Let your imagination run wild. 7) Make sure your suit fits right. The shoulders are the hardest part to fit right. This is because often, our two shoulders are different – one is often higher or broader than the other. This is why an off the rack suit will never fit you perfectly, since everyone’s body shape is different. If you bought a ready-made suit, bringing it to a tailor to get the shoulders altered will set you back a pretty penny. That is why I recommend having it made-to-measure – just make sure the shoulders look and feels good (refer to the above infographic) during the fitting sessions. 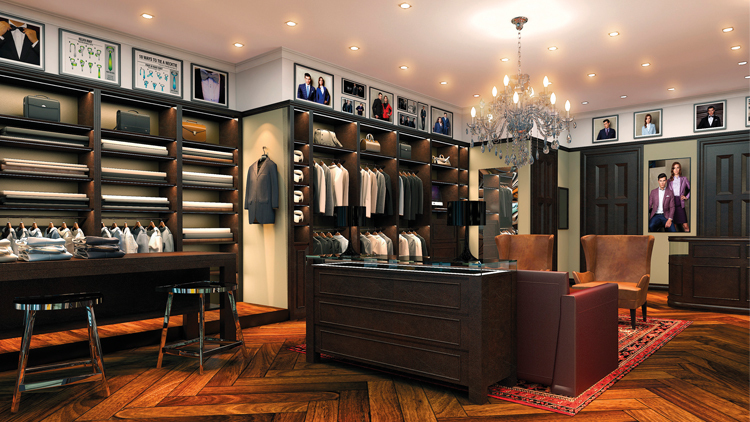 If you’re going down the bespoke path, trust your tailor with the fit – those guys are the experts of their craft. Secondly, look out for the waist fit. A good-fitting suit should adhere to the curve of your torso nicely, but remain loose enough so that the fastened button doesn’t look like it’s hanging on for dear life. (Refer to the above infographic) Often, off the rack suit makes you look rectangular and boxy, like a robot. Get them tailored, or better yet go to a made-to-measure/bespoke (if you’re rich) tailor. Ah, another often neglected detail. Your sleeves should be short enough to show 1/4-3/4 inch of shirt cuff. (Refer to the above infographic). Often, an off the rack suit will be too long. It’s important to either get this tailored or made-to-measure because our arms are often of different length, and thus adjustments have to be made accordingly. I see a lot of people overlook this, and it’s such a shame. I hope that this article has made you guys more knowledgeable about what to look out for when buying a suit! I’ll personally advise one to go to a made-to-measure tailor – you can get a good quality 2 piece suit for as little as $299! While that may seem a lot at first, remember that a good suit is an investment, and should last you years. In any case, it’s not significantly more expensive than stores like H&M and G2000! (Remember, the $299 price covers both the jacket and trousers) If you already have an off the rack suit, get it altered at your local tailor – you will look a hundred times better. On a budget of less than $400, where are some places i can visit to get a good suit off the rack? 🙂 Looking for a suit for my wedding day and i’ve only went to places like benjamin barker.